Preheat the oven to 375ºF. If using crescent rolls, unroll dough, separate at perforations to create 4 rectangles. Press the other perforations to seal. 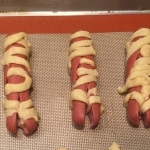 Wrap strips of dough around the individual arms and legs and then around the body of each hotdog, leaving an area about a half an inch long where the mummy’s face is. Place the mummies on a large, ungreased baking sheet and lightly spray the dough with cooking spray. Bake for 13-17 minutes or until the dough is light golden brown and the hot dogs are cooked through. With mustard or ketchup, draw two eyes on the mummy’s face. Tip: Lightly spraying the dough with cooking spray will help it bake up golden brown. Tip: If substituting 1 can (8 oz) Pillsbury™ Refrigerated Crescent Dough Sheet for the Pillsbury™ Refrigerated Crescent Dinner Rolls, unroll dough and cut into 4 rectangles. Proceed as directed. Adapted from Pillsbury, General Mills, Inc.